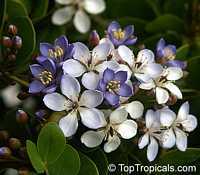 Lignum vitae. An evergreen tree with a twisted trunk, opposite oval compound leaves and showy bright blue flowers. Lignum vitae can be grown in full sun or partial shade on a wide variety of soils, including alkaline. Plants will easily tolerate wet or dry soil, wind, and salt, making it an ideal choice especially for seaside plantings. Some of the resins active ingredients are effective anti inflammatory agents. Close related to Guaiacum sanctum, but flowers are brighter.